Faucette Farms dates back to the early 1900's from which many generations of farmers have come to love and respect our land and heritage. Over the years our farms have developed from a small family tobacco farm with minimal amounts of produce to a much larger farm that has helped to feed our employees, friends, and our family. Thanks to our customers the hard work of our loyal employees and our family. 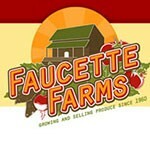 Faucette Farms now supplies fresh produce to a multitude of families. Not only does the farm grow well known organics, such as yellow squash, they also raise special, lesser known varieties, such as spaghetti squash. Zucchini, cucumbers, sweet potatoes, pumpkins, blueberries, onions, and a variety of herbs and beans are all organically grown crops that are found in a abundance at the farm. Although the corn is not certified as organic, it is grown just like the rest of the organic produce. Along with the farm's wide variety of fruits and vegetables, country cured meats and sausage, made from the family recipe that has been handed down through the generations can be found at the farm.